Splash has learnt that another very large ore carrier (VLOC) belonging to Polaris Shipping has run into difficulty off South Africa. The South Korean owner is coming under enormous scrutiny on home soil following the disappearance – and presumed sinking – of the 266,000 dwt Stellar Daisy on Friday night. A multinational assortment of search and rescue teams have since been scouring the South Atlantic off Uruguay in a vain attempt to find survivors. Just two Filipino seafarers are known to have survived to date, with another 14 Filipinos and eight Koreans listed as missing. Despite scaling up resources in the search and rescue mission, poor weather and visibility is hampering efforts. Meanwhile, sources in South Africa tell Splash that another elderly VLOC belonging to Polaris has been forced to moor off Cape Town for urgent repairs. Like the Stellar Daisy, the Stellar Unicorn, also built in 1993, was making its way from Brazil with a cargo of iron ore when it was forced to reroute. 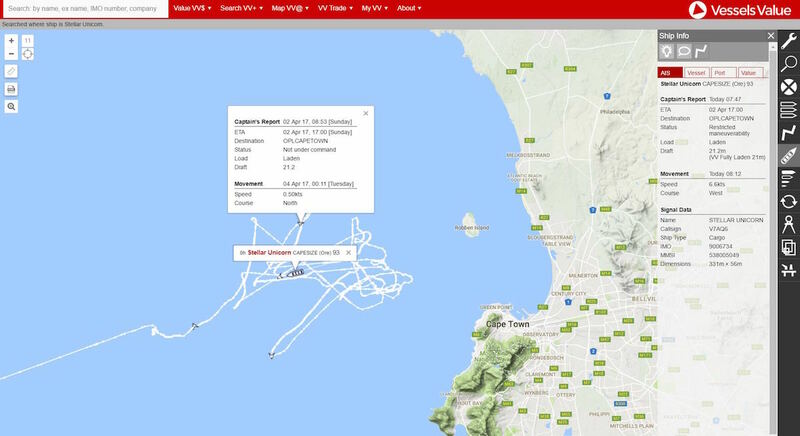 Tracking data provided by VesselsValue.com (see below) shows the ship has been just of Cape Town’s port limits for the last few days while repair work is carried out on the bulker. Its status is listed as ‘Restricted maneuverability’. Despite repeated calls to Polaris, the company has maintained a silence on all enquiries from Splash over the past six days. However, given the Korean firm’s stonewalling of the media, speculation has been rife and continues to mount over the plight of the Stellar Daisy. Splash is also awaiting updates from the ship’s P&I Club, Steamship Mutual, as well as its registry, the Marshall Islands. The ship, built in Japan originally as a single-hull VLCC was converted at Cosco Zhoushan Shipyard in China eight years ago. Six weeks ago, Chinese Port State Control inspectors found six deficiencies on the giant ship relating to its water tightness. 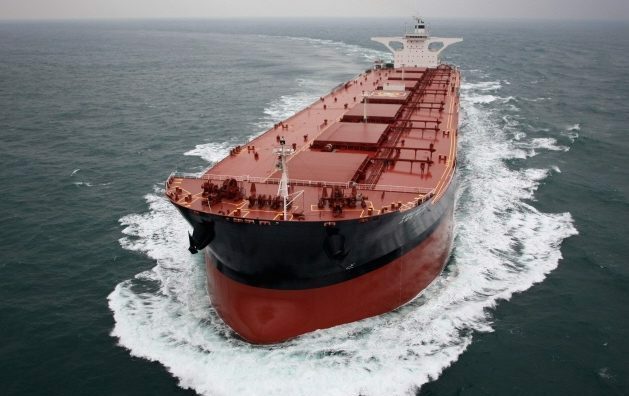 It was allowed to sail, and made for Brazil where it picked up 260,000 tons of Vale’s iron ore and was bound for China once again when disaster struck late on Friday with one of the survivors describing severe water ingress, a quick listing of the ship before it capsized. The fact that Polaris took 12 hours to form an emergency response team from the moment it was first alerted to the crisis has also earned it plenty of flak from families of the missing crew. Lim vowed to carry out a thorough investigation into the accident with many in the industry already anticipating class rule changes as happened in the wake of the MOL Comfort boxship breaking in two four years ago. “It is expected that there will be a full investigation into this accident and that the results and findings will be brought to IMO so that we can do whatever may be necessary to reduce the chances of such an incident happening again,” Lim said. Polaris is the world’s largest VLOC owner. It had made talk of pushing for an IPO by this July, something that will now need to be relooked at in the wake of the Stellar Daisy disaster. SIMPLE – IT WAS POOR MAINTENANCE & !!!!!! !